This is one of those where there is a little info out there but mostly incomplete. With all the threads I searched, I only found one claiming that it was fully installed. 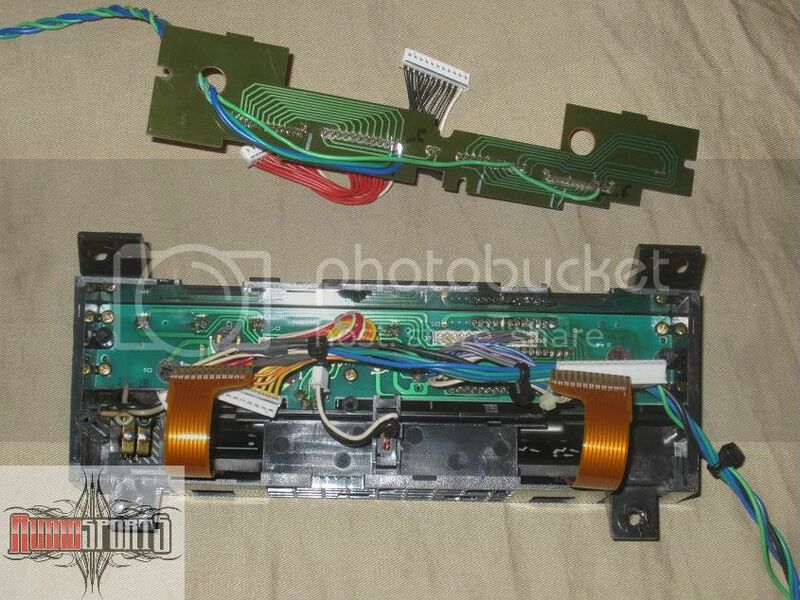 Even then there are only pictures of the control unit and none of the other required parts. I debated whether or not to even bother with a write up but ultimately against my better judgement I did it anyways. This write up explains most everything in detail but don't go riding off on your unicorns to mystic lands just yet. This a fairly involved process that is time consuming. Expect to give yourself 3-4 days to complete this cleanly. It could be done in a weekend if you want to do a hack job. For complete operation the dash has to come in order to remove the heater unit. While installing the dcc is not overly difficult, it is very involved and beyond the capabilities of the inexperienced. Meaning if you don't understand it, you probably don't have skills required to complete this. The 4th gen Accord digital climate control system differs from the USDM system by a few things. Luckily all you need from jdmland is the the controller as the rest of the parts can be sourced from a variety of US cars. 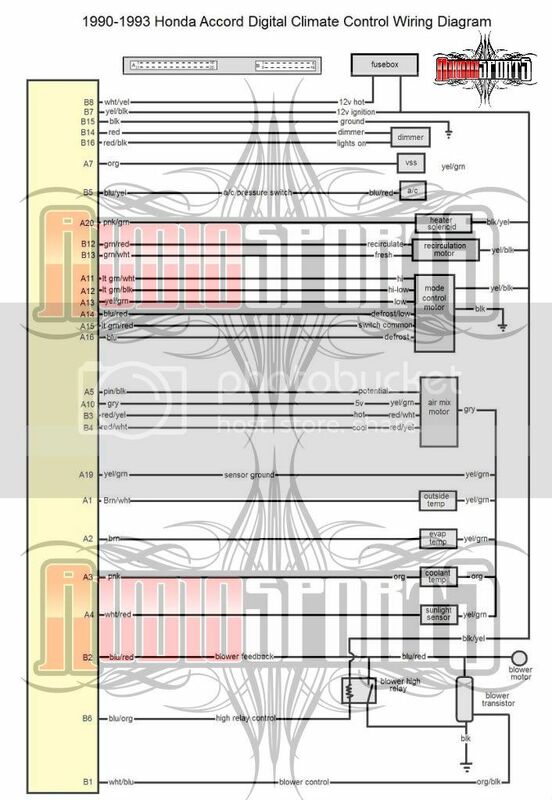 As far as wiring goes, there wasn't a cb7 specific diagram that I could find. After about 15 hrs comparing diagrams from various Honda's, I figured 95% of it. The rest was simply tested with a vom and by process of elimination. Since I was unsure of how everything would work out, I started out to get the basics that just required simple wiring working before removing the dash. Remove the console and dash bezel to get to the heater control out. I wanted to make a plug so I didn't have to cut the connectors off harness. I cut female side of an icu then soldered the dcc wires to it. Then I depinned the terminals of the stock male connector and inserted them into the ICU connector. 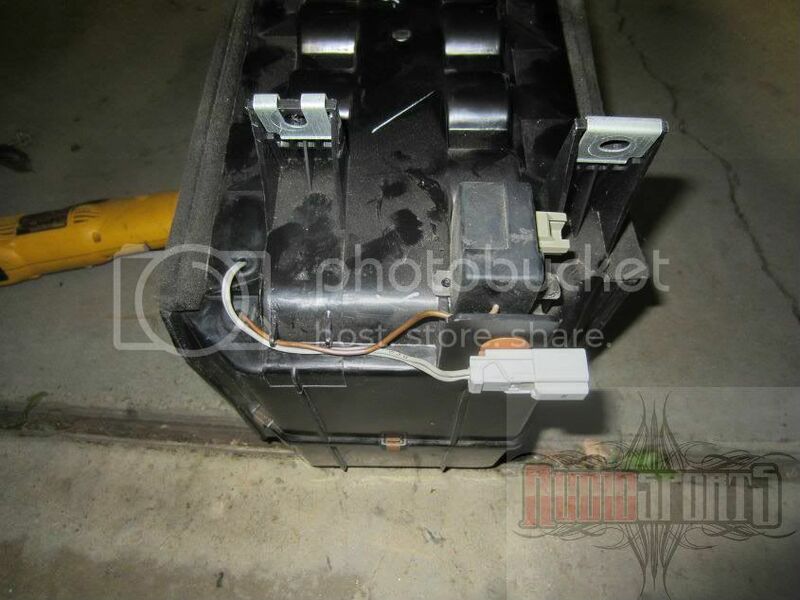 the basic power wiring is all present except for 12v constant power which can spliced into at the hazard switch above. 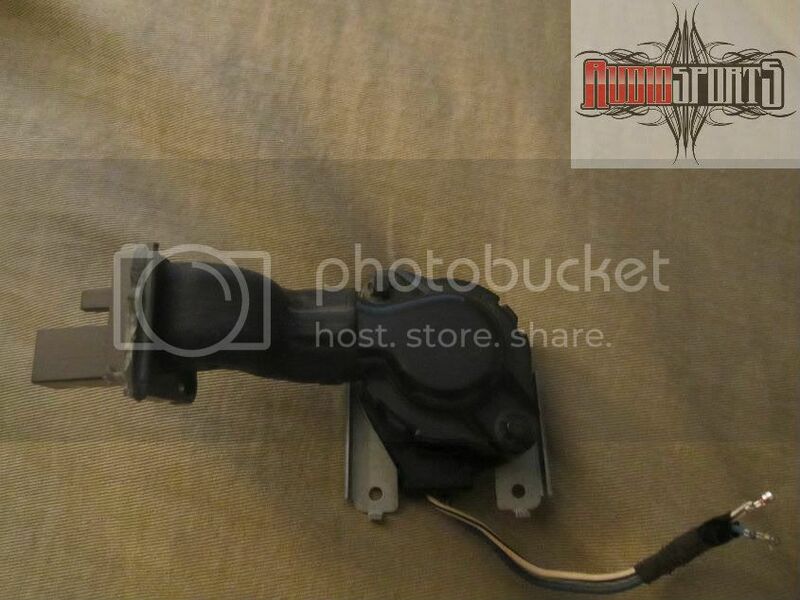 Wire in the 12v, ign, gnd, a/c signal, illumnation and dimmer. Test it out make sure it powers up, the backlighting works, and the compressor engages. 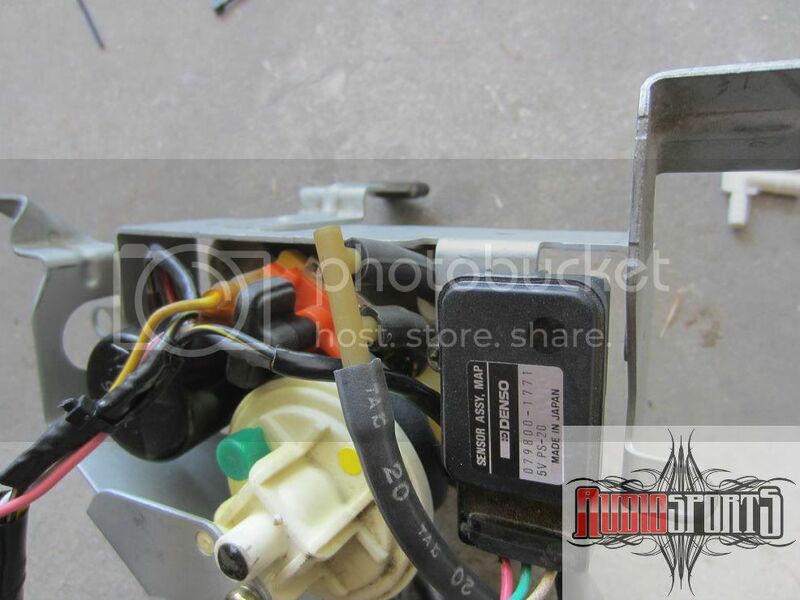 Next wire the mode control motor and the recirculation motor. These are color to color with existing accord wires. After wiring, reconnect the original blower switch and turn on to get some air moving, test mode motor to make sure all is working. Test the fresh/recirculation motor. 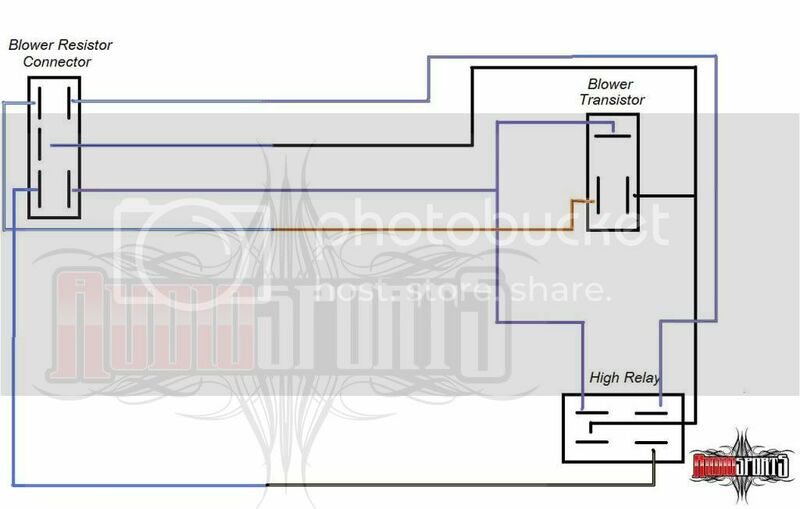 If all is well, move on to the blower transistor and high relay. 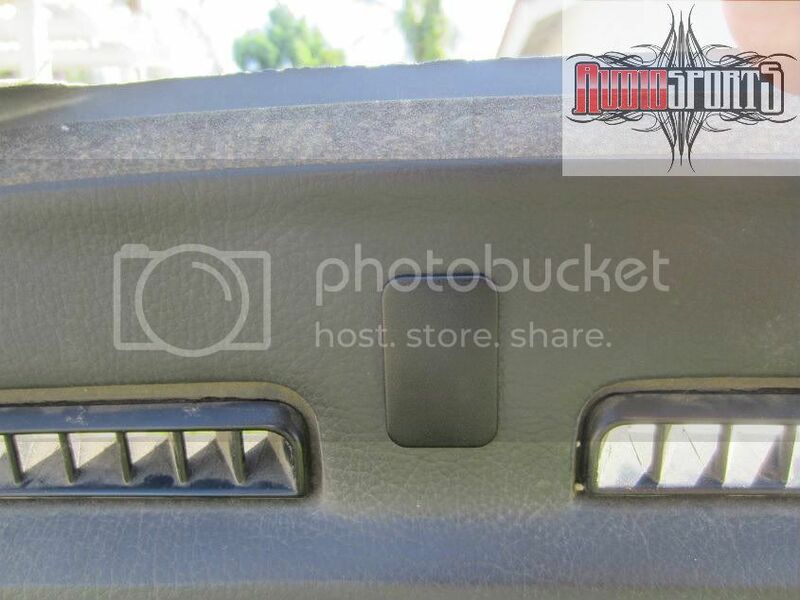 Remove the glove box, glove box bracket, and bolts holding right side of dash. Unbolt the ecu/tcu bracket and swing out of way. 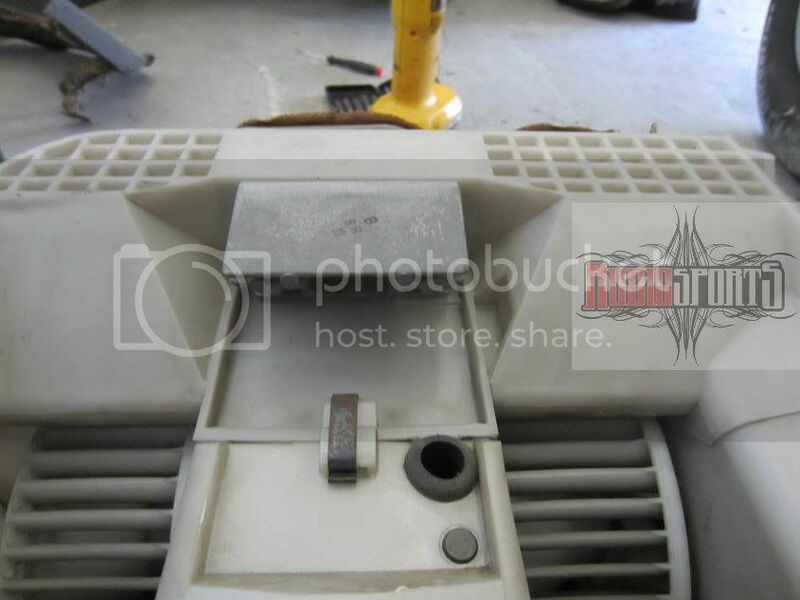 Remove two screws from bottom of blower to remove bottom lower trim. Remove clip to remove blower lower section. Remove the the 3 nuts and and unplug the wiring connectors then carefully remove blower motor. 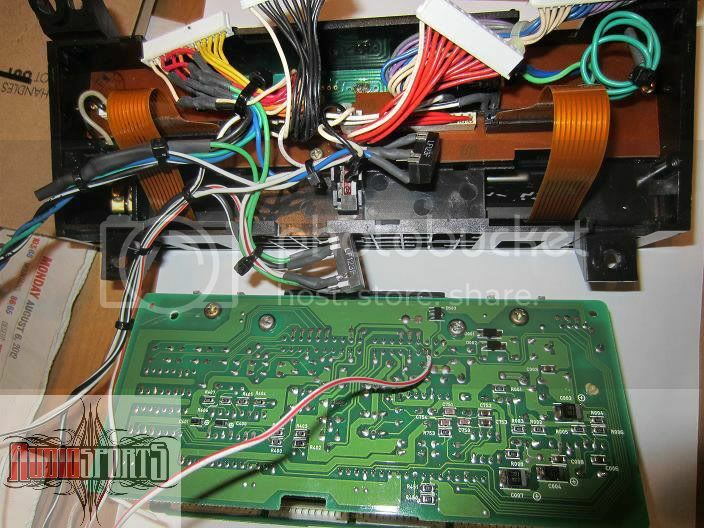 In order to wire the blower motor to the dcc, you need to replace the stock blower resistor with a transistor. The jdm cb7 mounts the transistor to the evaporator case. While this an optimum spot due to airflow, the USDM car evaporator does not have a spot where the transistor can mount so I just mounted it to where the resistor goes. You will also need to add a bypass relay to bypass the transisitor for when full output is selected. Any standard relay will work but I kept it factory and used a stock relay from a 1st gen Acura CL. 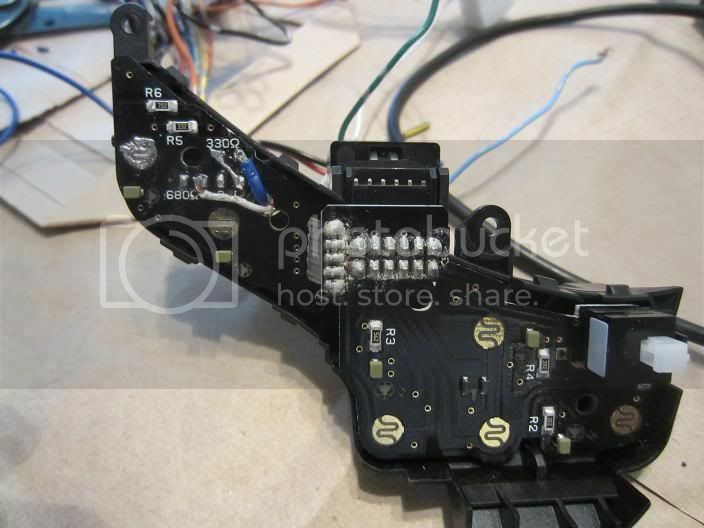 Cut off the existing wires at the resistor and wire as shown below. 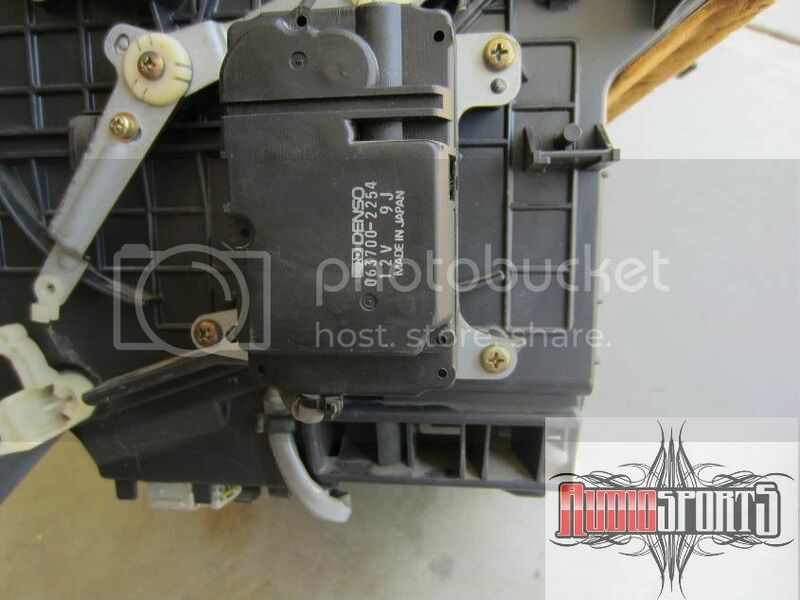 This eliminates the need to run wires to the control unit and blower will unplug like normal. After completing the wiring at the blower rewire the heater control blower speed connector as below. 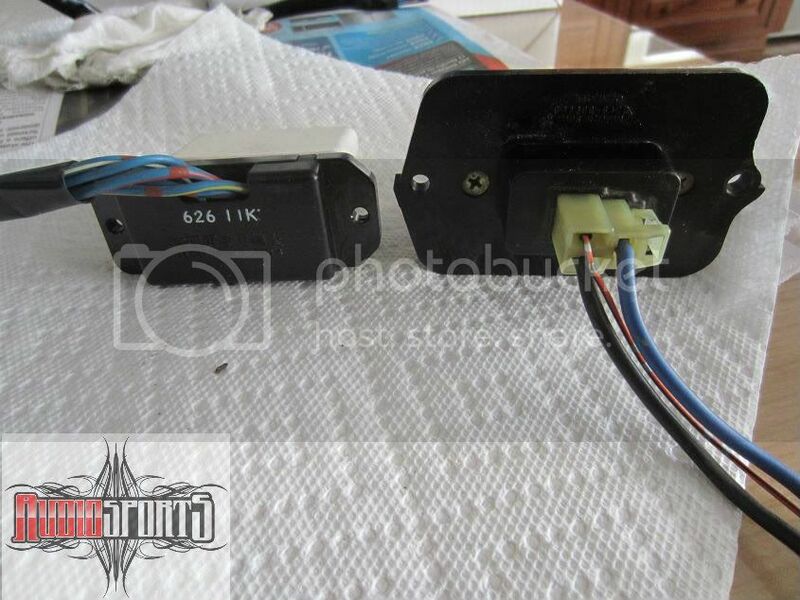 The jdm dcc uses a transistor that looks similar to the g2 legend but that will not fit into the accord blower housing. The first gen legend does not fit and the 1st gen tl is not accessible enough to even try. The first gen CL transistor also does not fit but it can be modified to fit. The CL transistor and accord resistor mount differently. I cut down the larger transistor mounting base on a belt sander until it fit the opening. To install in the blower, I simply sandwiched the blower housing between the transistor heat sink and mounting base. I added a drop of thread locker just to be safe since removing the blower is a pain. I also bolted up the high speed bypass relay to the back of the blower. One the biggest hurdles to installing the digital climate control system is that the air mix on the standard accord controller is controlled by a cable. The DCC system use a motor to control the air mix. 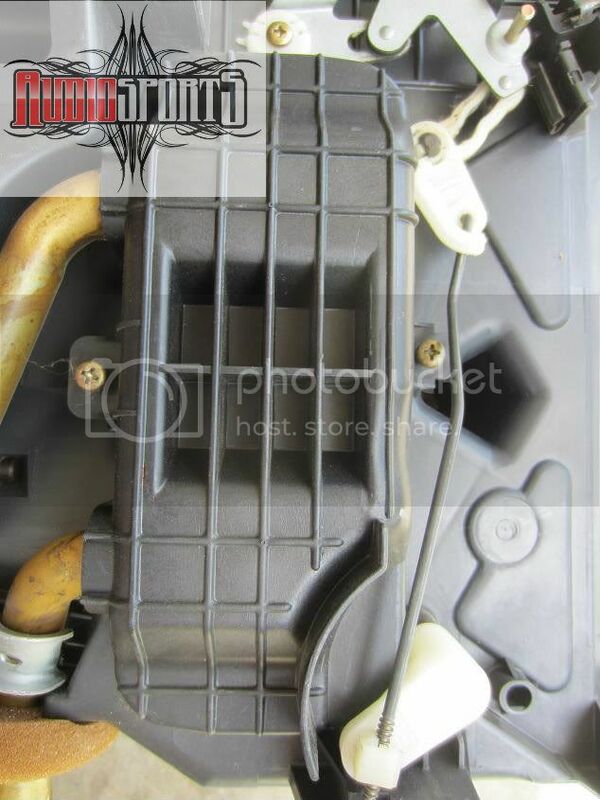 Since the all the cb7 DCC I have seen comes from RHD cars, none of the stock motor/linkage stuff bolts on the LHD heater box. 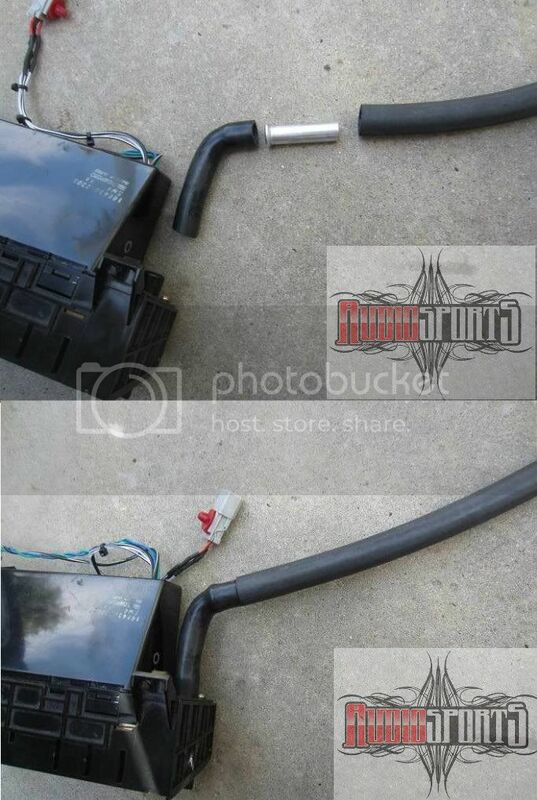 I used an air mix motor from a 1st gen Acura CL. To mount close to factory jdm spot, all linkages need to be redone or modified plus a new pivot arm made. To make the install simpler, the motor can to be mounted so the output gear is directly centered over the air mix linkage center pivot. This is so it will have the same arc on the motor control arm as the air mix linkage arm. The location the motor needs to be mounted in, is where the floor vent outlet clips on the bottom of the heater housing. I made a bracket to bolt to the motor and to the bottom heater outlet. On the other side of the motor, I made a bracket from the motor to the metal 'L' tab that is used to clip the floor outlet vent on. I then had the three pieces welded together. 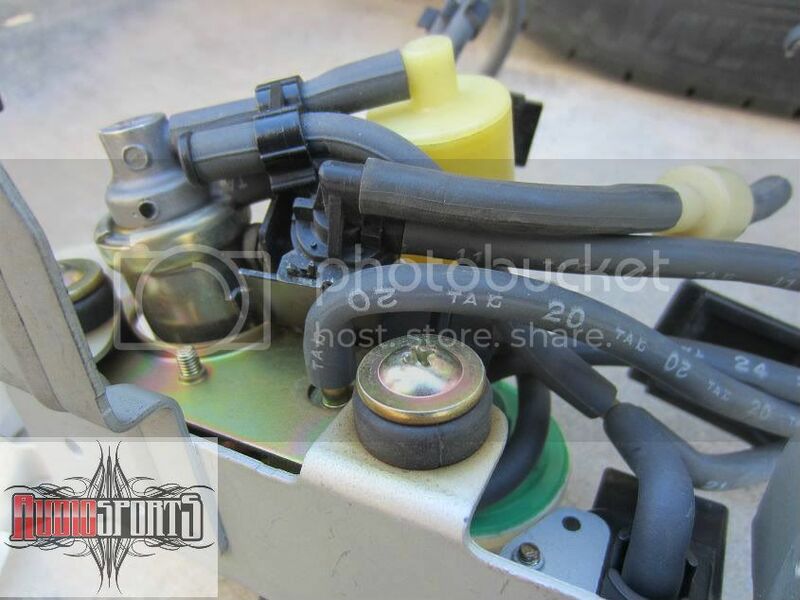 Once the motor is perfectly centered, set the motor and air mix linkage to full hot. Loosen the motor arm's nut and align the arm with the air mix linkage control arm pin. Mark the motor's arm where a hole will need to be for the linkage arm pin. Drill a hole and slot it slightly so there will be no chance of binding. Use the plastic insulator so it moves freely. 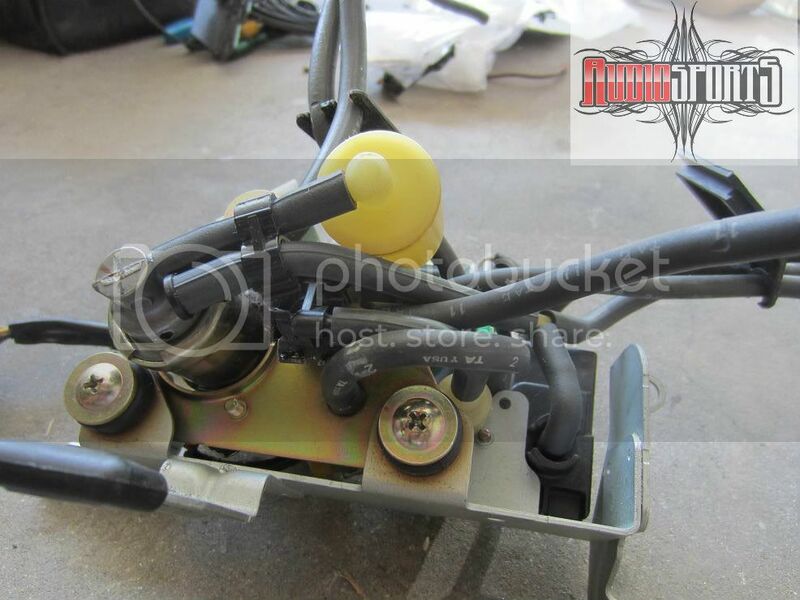 The air mix motor actually rotates the wrong direction. Hot is cool and cool is hot. The motor operates on reverse polarity output from the dcc so this easily fixed by swapping the two control wires. Now the hot/cool will be in sync but will go to full cool or full hot with nothing in between. 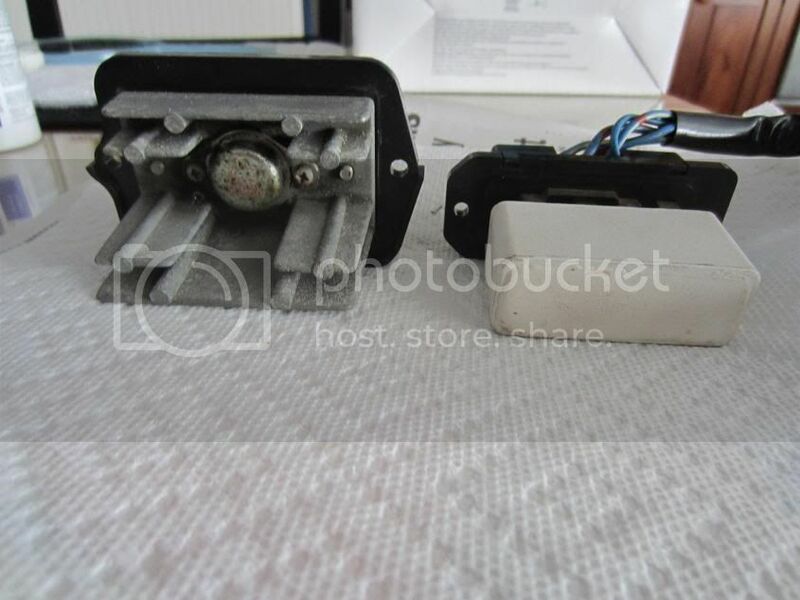 What makes it operate in steps is feed back from a potentiometer in the air mix motor. The feed back is backwards when the motor wires are swapped for hot/cool direction. 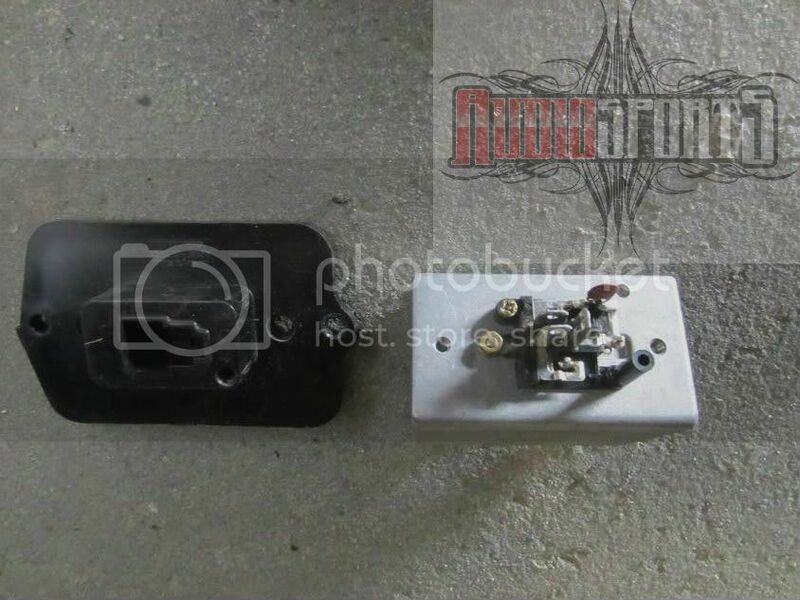 This is also fixed simply by swapping the 5v reference and sensor ground wires going into the pot. Last edited by lucifer1; 09-30-2012 at 12:37 AM. The heater valve operates differently with the dcc setup. The normal setup varies the opening with air mix cable. The dcc leaves the valve open all the time and closes it when the temperature is set to max cool or 18c. It does this through a vacuum actuator connected to the heater valve instead of the normal cable. When max cool is selected, the solenoid is opened allowing vacuum to reach the actuator which closes the heater valve. While I think the stock accord cable setup will work fine with the dcc, I still went ahead and installed the vacuum setup as it was designed. 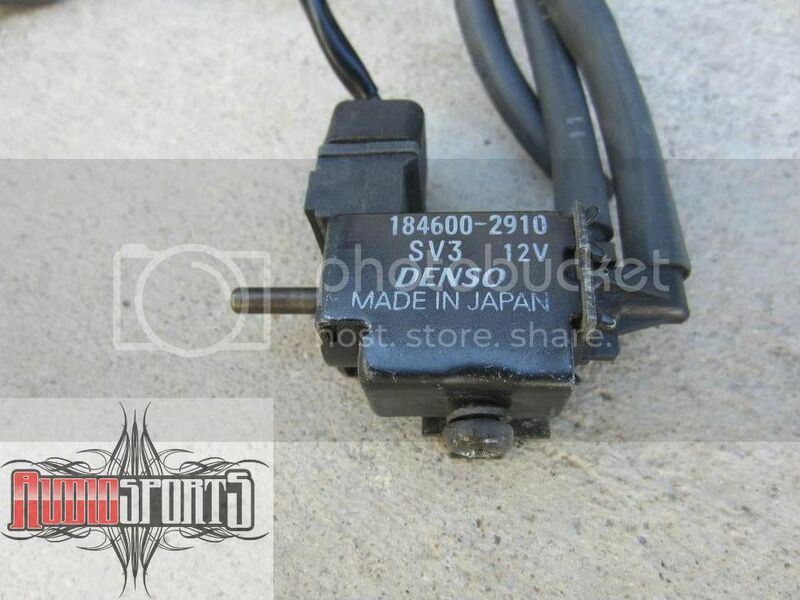 existing solenoid. The heater valve solenoid output hose is routed to the bottom of the emissions casing and exits through a new hole I drilled. Cut the black vinyl tubing so that there is just enough left to cover the wires on outside of emissions casing. Cutting the vinyl also makes it easier to run new wire through to the 4 pin connector. Wire the blk/yel solenoid wire to existing blk/yel power wire. Run yellow through the vinyl tubing and into the open terminal spot of the 4 pin emissions connector. Then add a pin into the other side of the connector and run wire to the dcc. 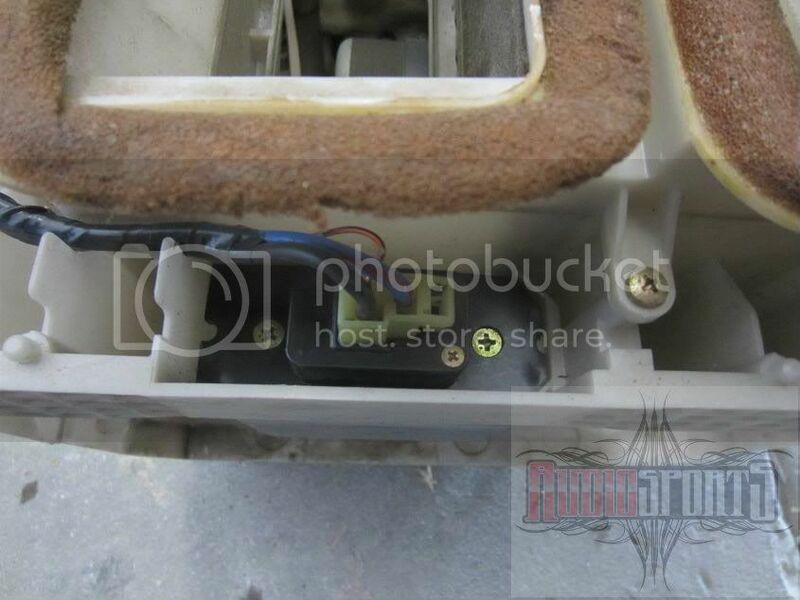 Use the fog light wiring grommet below to route wire inside. Add a 3 pin connector to unplug for servicing. Empty terminal slot on 4 pin connector. 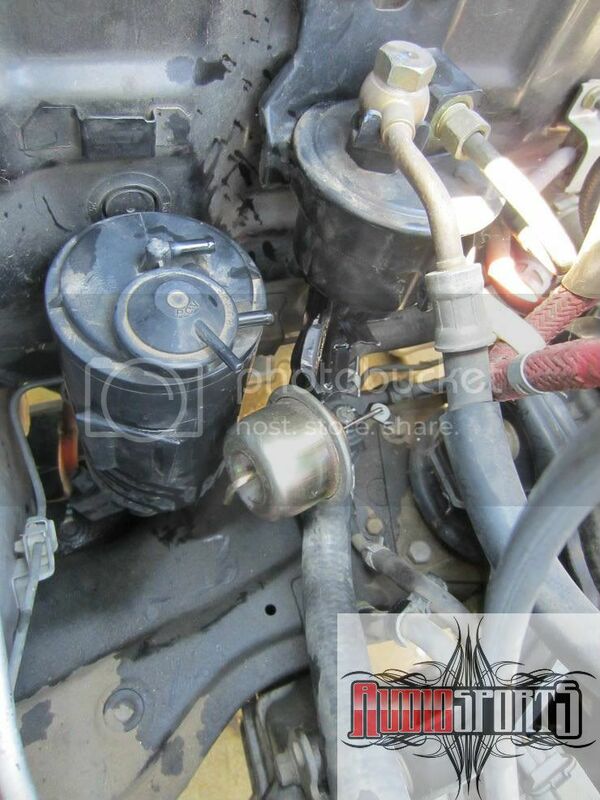 With the emissions box still removed, remove the fuel filter bolts and charcoal canister to access heater valve. 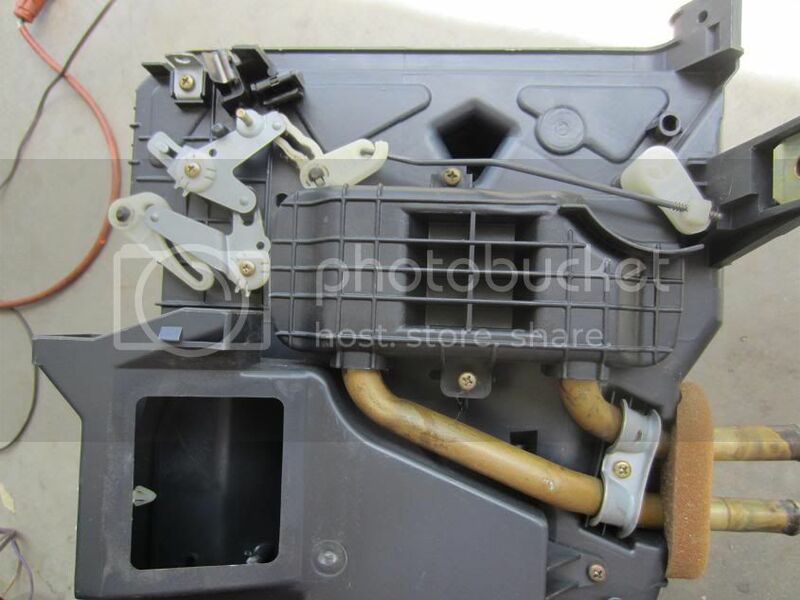 Remove the heater valve and replace it with one from the vacuum actuated heater valve. 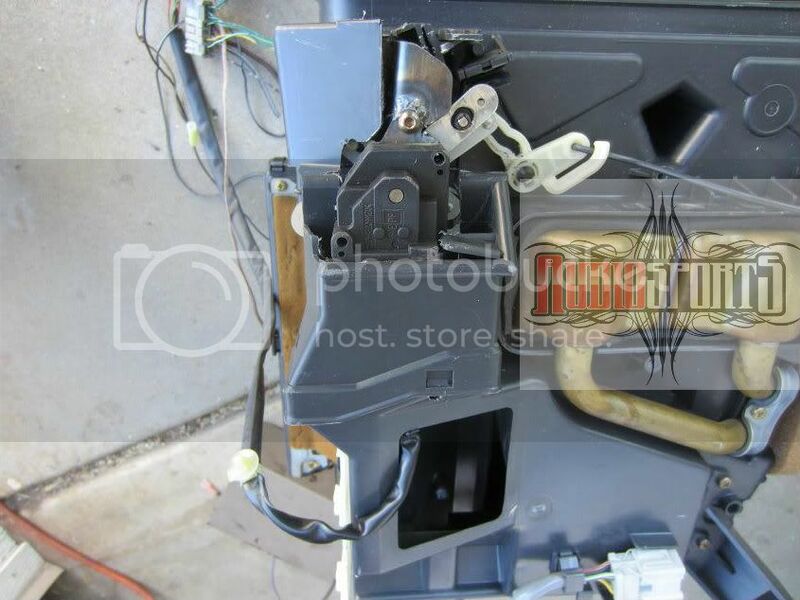 Cut the TL bracket down and mount together with stock accord bracket by heater valve screws. I welded the two brackets together with a reinforcement plate for extra support. 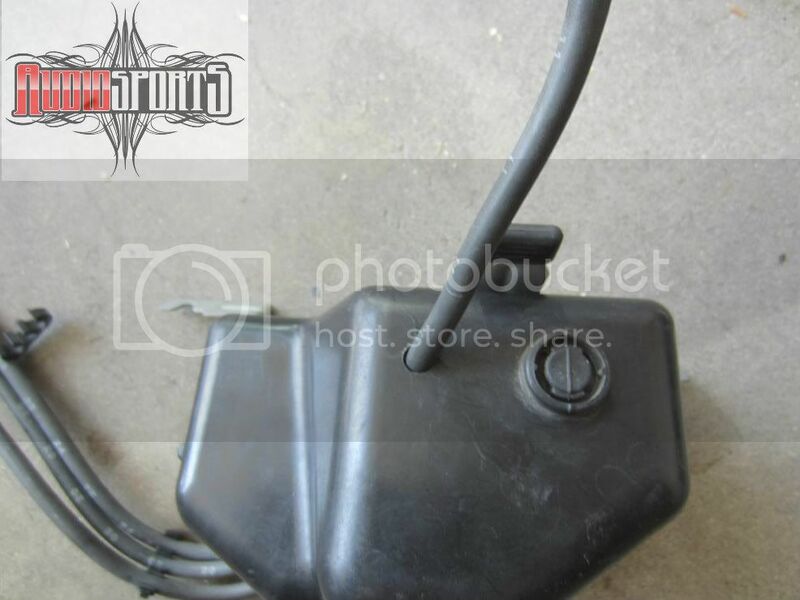 Run the vacuum hose to the solenoid. That completes the basic setup and you should have working fully working heater and a/c. If you want to make the auto climate control work, the rest of the sensors(sunlight, evap temp, outside temp, interior temp aspirator, coolant temp, and vss) need to be installed. 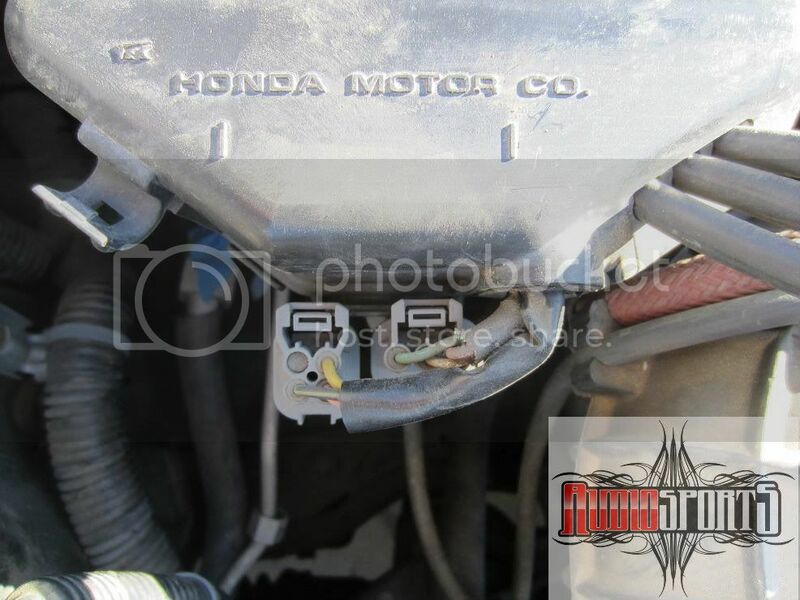 Any evaporator temperature sensor from a Honda climate control system will work. Electronically they are all the same. 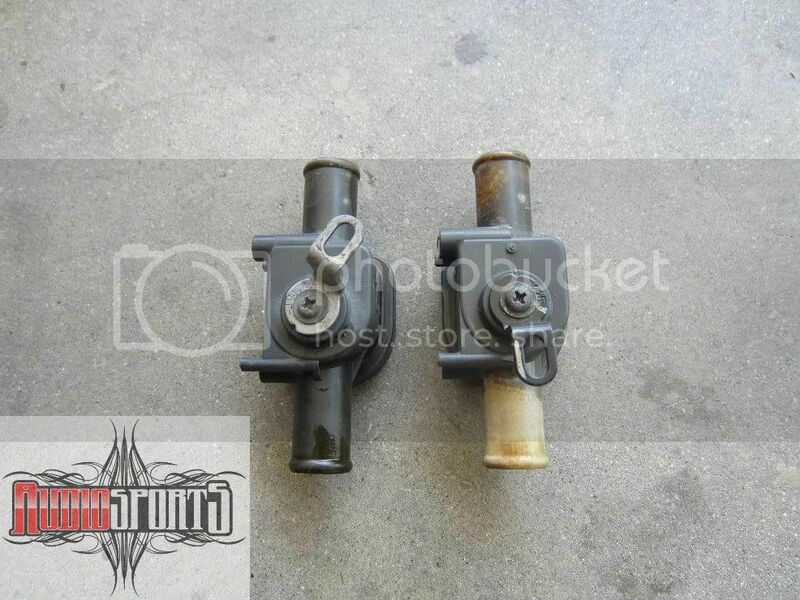 I used one from a 1st gen Acura CL. 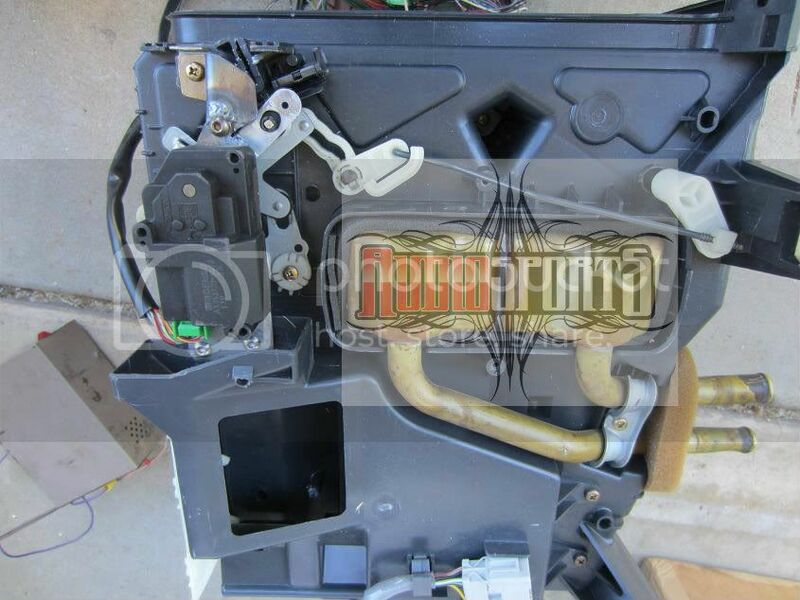 The evaporator temp sensor goes into the evap housing on the heater side. The CL sensor has a clip on it that mounts into the fins, fifth row in. My a/c was already discharged so I removed the evaporator to make it easier work on. It was actually pretty dirty inside and couldn't be cleaned properly without removing it. The evaporator has a temperature switch in it already that is not used on the dcc system. Unplug the temp switch and connect the wires together to so the a/c signal will pass on. I just left it alone as another safety.I drilled a hole on top the housing near where the original temperature switch enters. I used a temperature switch grommet to pass the sensor through and seal the hole. 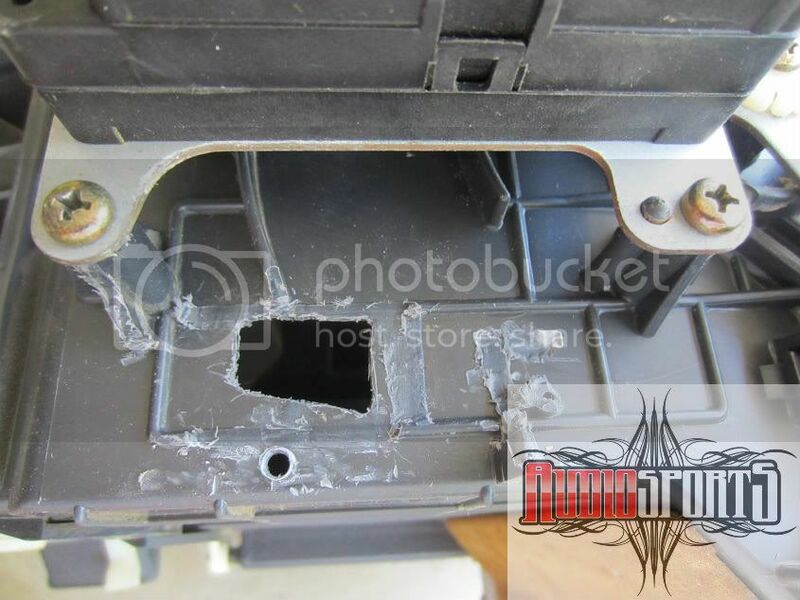 I also drilled a hole in the housing tab to clip the connector on. The JDM CB7 outside temperature sensor clips on to the bumper. 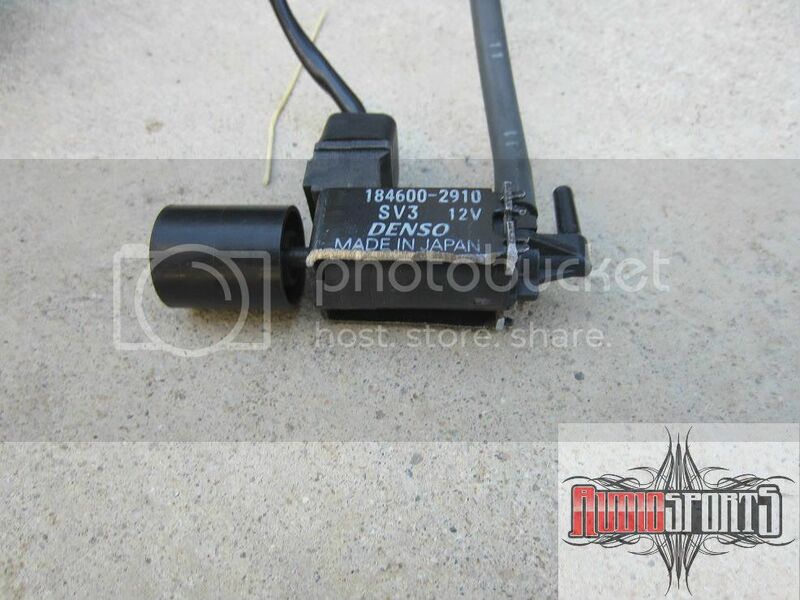 This style of sensor can be found on the 1st and 2nd gen Legends but any outside temperature sensor from a Honda climate control system will work. Electronically they are all the same. 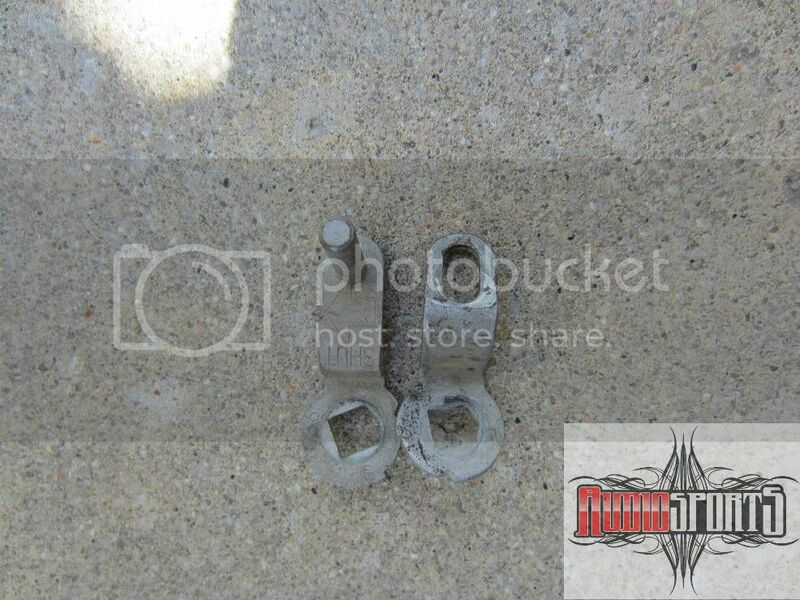 I used one from a 1st gen Acura CL with the plastic casing and an actual bolt down mounting bracket. 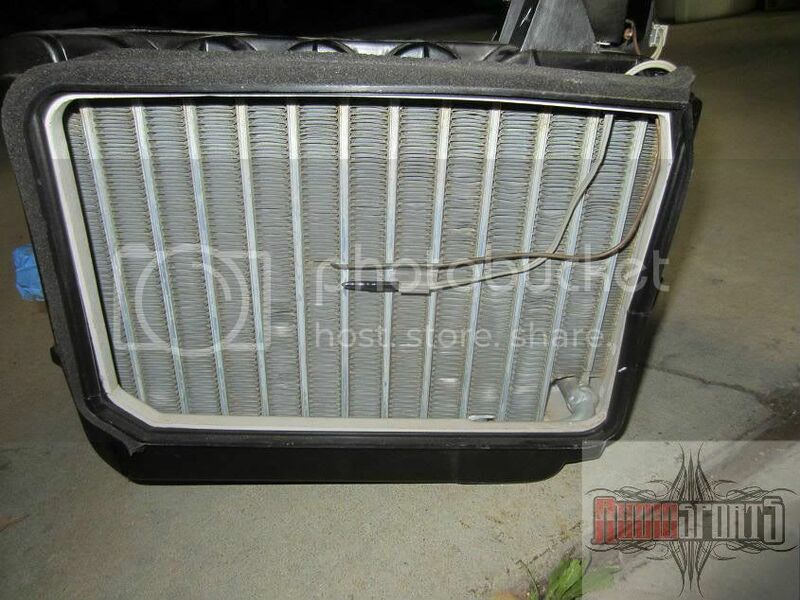 The outside temperature sensor mounts on the core support behind the bumper grill opening. I actually mounted it towards the passenger side of the bumper opening to a power steering cooler bracket bolt. Run both wires back to the dcc. 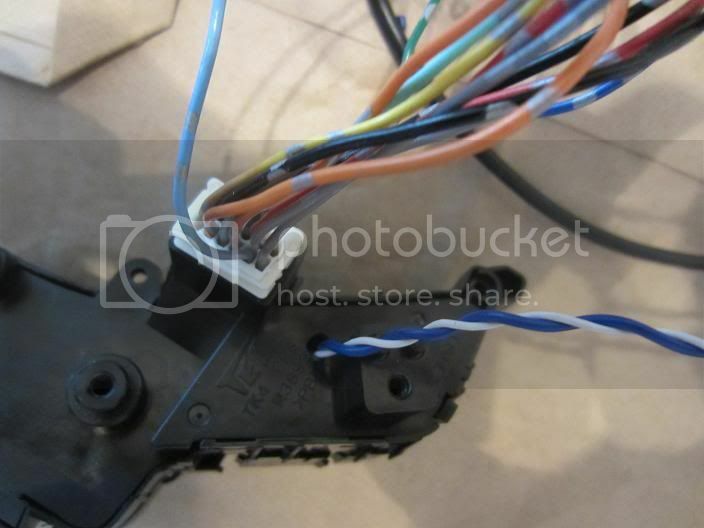 Follow the same path as the fog light wiring harness and through the 3 pin connector from the heater valve wire. 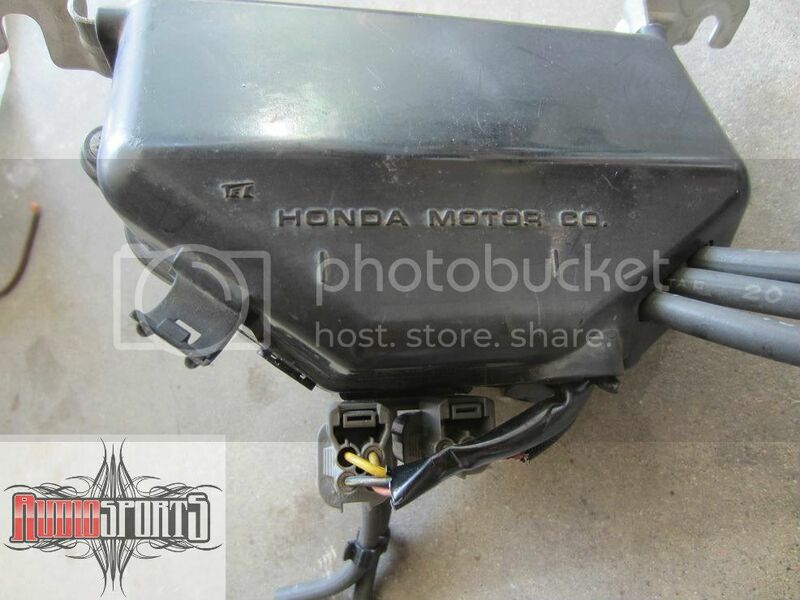 Any sunlight sensor from a Honda climate control system will work. Electronically they are all the same. The sunlight sensor goes on top of the dash either in the center or off to the side. 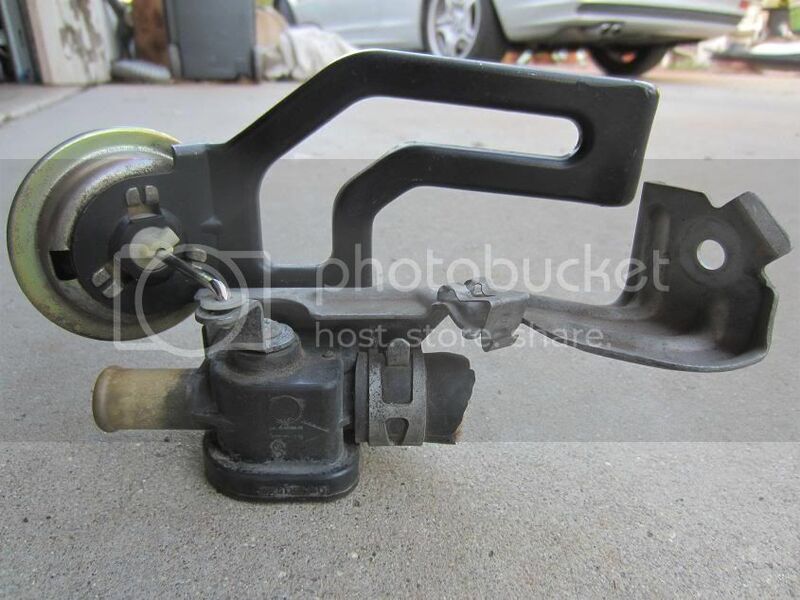 I used one from a 1st gen Acura CL/6th gen Accord since it would mount the best. Make a hole in the dash between defroster vents and clip it in. This will take a bit of time since the dash is metal between all the foam. The coolant temperature sensor for these older systems is actually in the heater housing and does not use the signal from the engine like newer ones. 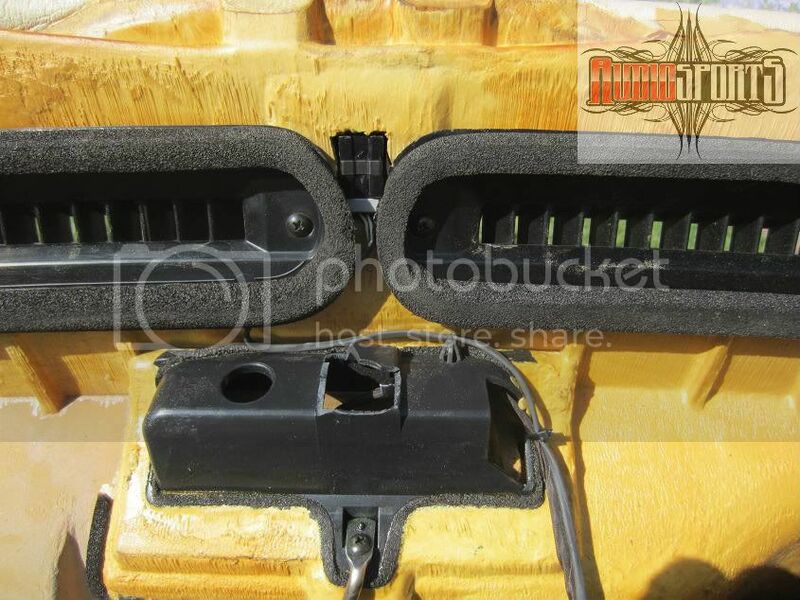 The sensor mounts against the heater core inlet side. 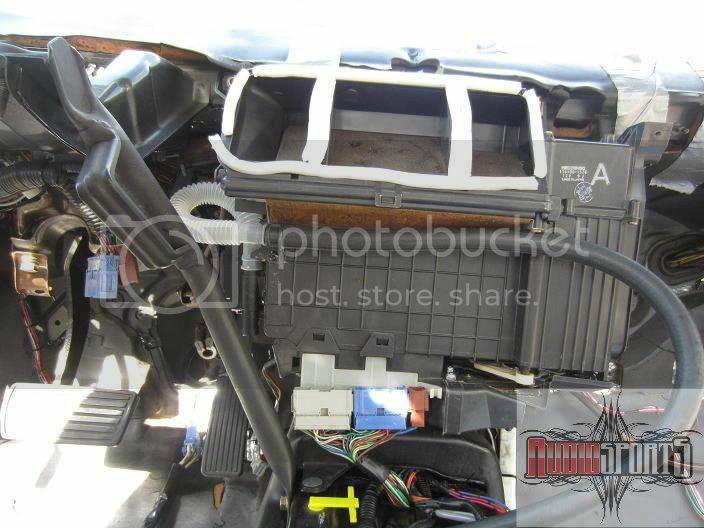 This requires removing the heater housing to get to the heater core. I used a sensor from a 2nd gen legend. 1st gen legend will also work and is much harder to remove out of donor vehicle. The sensor will fit under the heater core cover but the cover still needs to be trimmed to fit back on a bit better. On newer models the sensor connects through a tube to a nozzle(aspirator)mounted to the heater housing, the air exiting through the aspirator draws air through the tube. There seems to be different versions of aspirators in every generation. 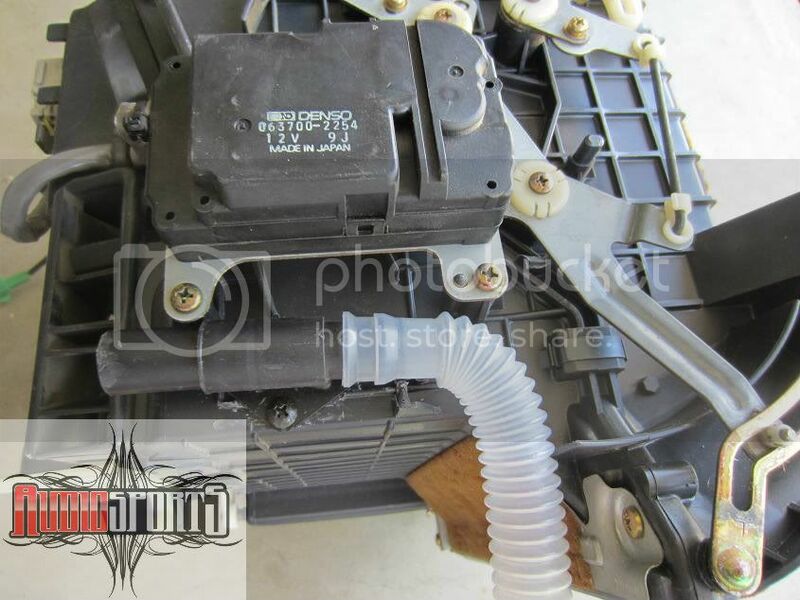 1st gen CL and 6th gen accords aspirator mount on a male protrusion the heater housing. 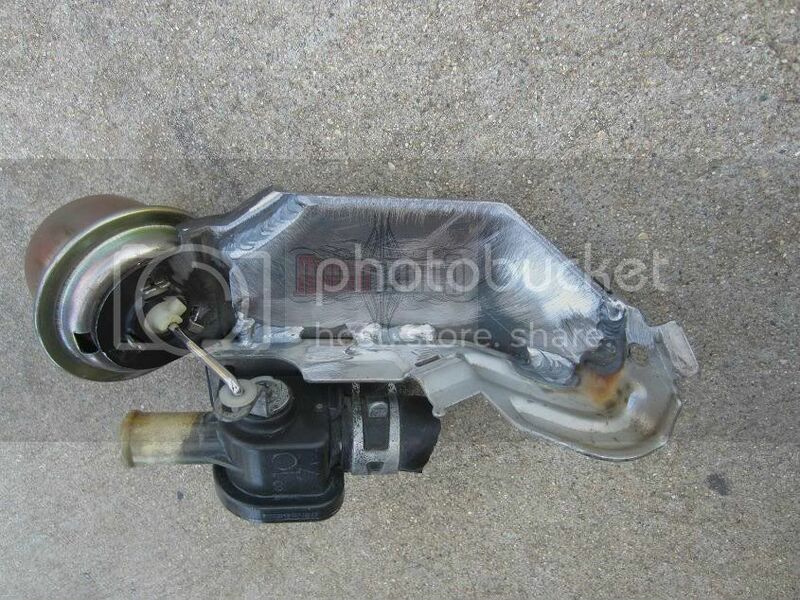 The 2nd gen TL has the male part in the aspirator and just a plain hole in the heater housing. I chose to use an aspirator from 2nd gen Acura TL . It needs to mounted in a spot where air is constantly flowing and not closed off by any of the diverters. Meaning after heat/cool blend doors but before the hi/low/defrost diverters. I decided to mount it in the front corner on the drivers side. The aspirator uses a corrugated flexible plastic hose to the sensor or a tube union. This hose not long enough or sized to fit the dcc. I used a tube union from a 1st gen Acura CL. From the tube union to the dcc, I used the matching rubber hose from a 1st gen Acura CL. 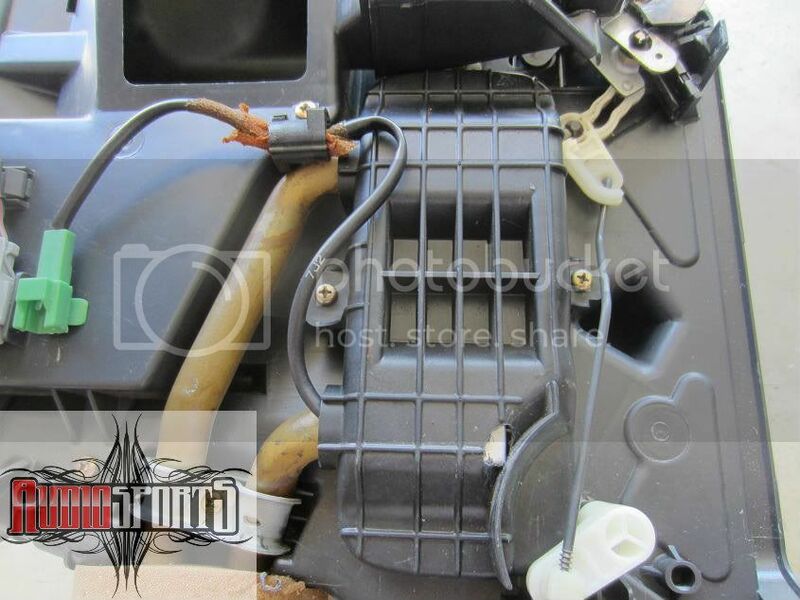 Cut out the odd shape of the aspirator inlet in the heater housing. Use a screw to secure it. Route the matching corrigated hose from the side of the heater box and secure the tube union. Run the ruber hose from the union to the dcc. Attach the clear flex tube and union to the aspirator. Drill a hole in the heater housing for the tube union locator pin. Then secure the tube union wth screw. 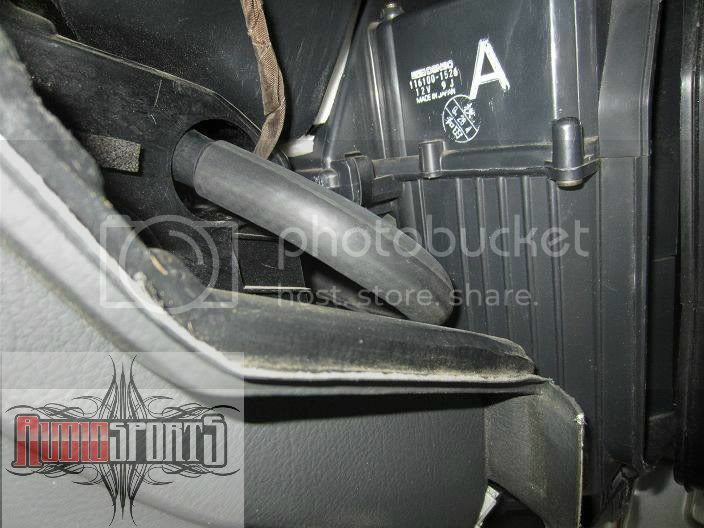 Attach generic rubber hose to the other end of the tube union and route towards passenger side. Cut a small 90 degree piece off the molded rubber hose and attach to the dcc. Connect the generic hose and factory hose together. I used aluminum tube and flared it on one side since hoses are different sizes. Finally connect the vss wire to cluster. Since the dash is out I ran it to the cluster to keep the wiring inside the dash. Remove the dcc and disassemble. Solder wires to the back of switches for temp up, temp down, fan, mode, auto, and off. 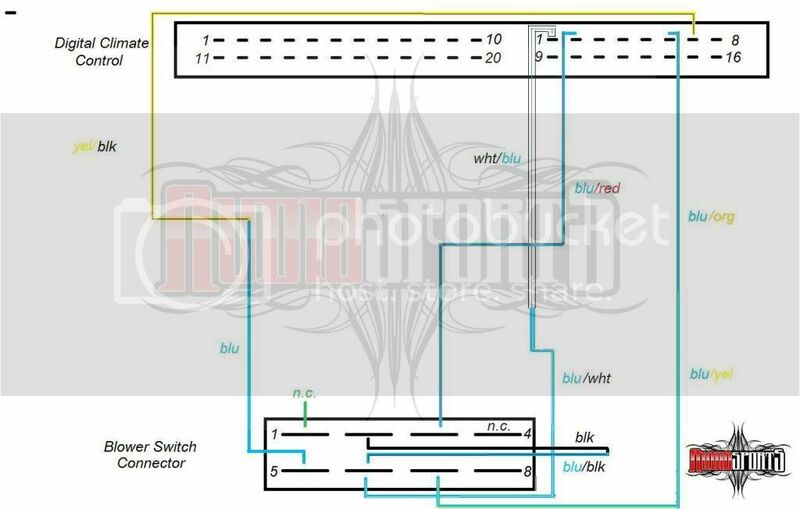 Run the wires to a relay for each switch to be used. The buttons on the steering wheel will trigger the relays which will act like pressing a button on the dcc. I used small reed relays so I could fit them inside the dcc unit. I modified the switches of my 2009+ Tl steering wheel so instead of 3 switches on 1 wire, I have 3 discreet output wires. 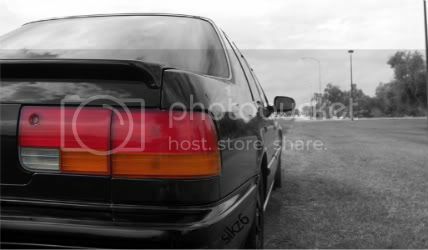 Last edited by lucifer1; 09-30-2012 at 12:36 AM. Are you for real right now? This is some legit work man. Great job. And thank you for taking the time to make this very informed diy. 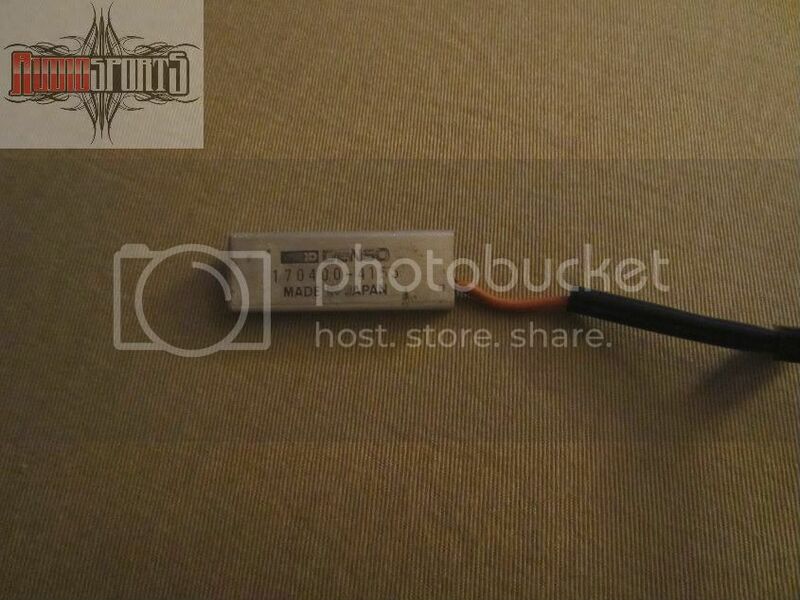 "My FOR SALE thread - Click here"
Amazing work. Most of us are in awe of what your capabilities are when it comes to figuring out difficult projects. Thank you for taking as much time as I know even just this post took to contribute to this site. For those of us that have actually analyzed the issues presented by this install and the components theoretically required, we know exactly how difficult this was to come up with all of the information and assemble different parts to try them out. Not many people here will truly understand what you have invested in this and will still hope to order some parts and do it in a weekend. Bravo, good sir. Bravo. One question, though. You mentioned that the older style units did not measure an engine temperature at an existings coolant temperature sensor, but inside the cabin. 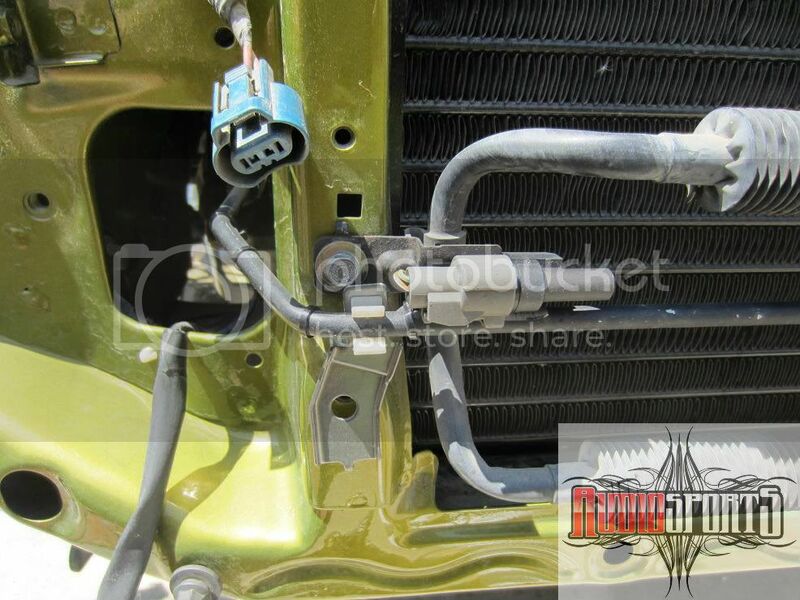 Why can't you simply obtain your signal from the sensor on the engine or a fan switch anyway? Would it be hotter at those points and outside of any parameters that the DCC would know how to handle? What's the reason? Why does the system use a light sensor? Can you turn off those beeps? Ptetty much, I thought about using an engine sensor but figured the temps would be different and the dcc was designed around a specific spot. 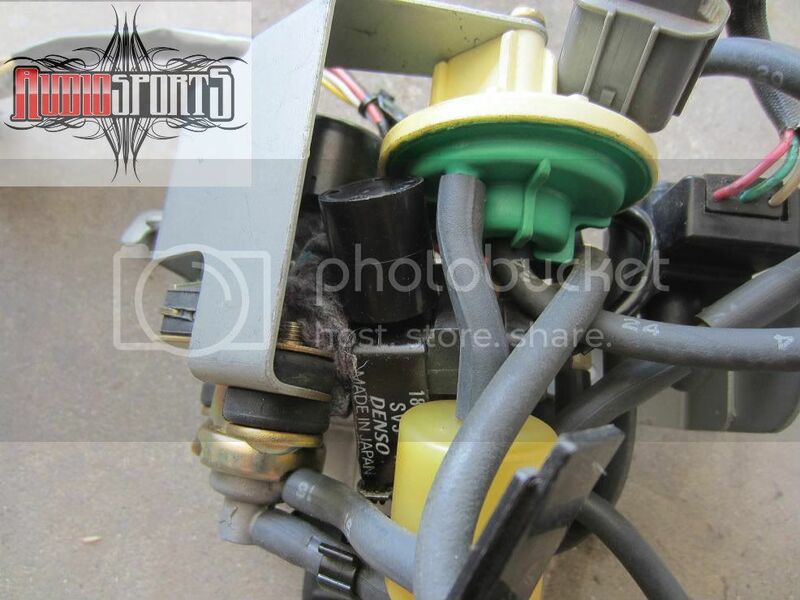 That coolant sensor is also used by Range Rover in late model vehicles. I would think to better calculate air temp and fan speed. Higher fan speed with more sunlight to cool faster. I don't know how to turn off beeps, but you could remove the beeper from inside. You. Are. Amazing. Thank you so much for all you've done for the CB7 Community!!! I was considering using a ton of custom electronics but it looks like you got it all mapped out with OEM parts. Great job! Good work man. This is a lot of work and dedication. Hopefully someone will follow this and do it. I might someday. Wow very intense and detailed work! Reminds me to try to do something. Cpmike and I have been having so many extra parts but never attempted! Awesome job, man! Props! I have had the parts sitting in my office for over 2 years and haven't been able to sit still long enough to actually finish what little I have started.